The Judge opens in Australian cinemas on October 9 and is distributed by Roadshow Films. Opens in the United States on October 10 and the United Kingdom on October 17. Without it's magnificent cast and smart direction by David Dobkin, The Judge would be in danger of becoming just another predictable family redemption melodrama. 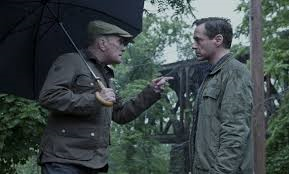 The saving grace of the charismatic presence of Robert Downey Jr. and Robert Duvall makes sure that what would usually be seen as stereotypical is given a disguise for it to be perceived as new and original. While the disguise may not be as convincing as it could be, the emotional intensity of the performances puts it above the majority of films in its cluster. High flying Chicago lawyer, Hank Palmer (Robert Downey Jr.) receives the terrible news that his mother has passed away suddenly and he will have to make his way back to his Indiana rural hometown for the funeral. The idea of returning to the place he grew up does not appeal to Hank as it means the reunion of he and his estranged father, Judge Joseph Palmer (Robert Duvall). It appears as though it will be a trip long enough only to have a confrontation with his father and be on his way, until it is discovered that his father has been involved in an accident and needs a very good lawyer for him to escape being convicted of murder. The Judge is not altogether predictable, but neither does it feel like something audiences haven't seen several times before. The family relations storyline about the troubled father-son relationship and about the son returning to his hometown to face his past is extremely predictable and almost painfully stereotypical with elements such as the compulsory encounter with an ex-girlfriend and reminiscing over family photos and films accompanied by nostalgic music. However, the film gains originality when the family aspect is combined with courtroom drama. It is the legal side of The Judge which keeps it intriguing as that is where the unpredictability in the film lies and it's screenplay becomes all the more interesting for it. Unfortunately, the courtroom drama and mystery of what happened on that rainy night are not enough to make the film overly memorable. Visually the film regains it's stereotypical family melodrama feel. Flashback shots in home movie style are used to visualize memories which Hank has running through his head and the town he returns to is much like any other town in which a character has made an effort to escape only to return to in order to face their demons. Yet it is a beautiful and quaint town which is a perfect place to go to reflect on life and is pleasantly captured on film. Even though the musical score is attempting to be light and nostalgic, it comes across as more dated and timeworn. As Hank Palmer, Robert Downey Jr. shows how he can regain his charismatic and enjoyable persona and take it emotionally wherever it needs to go. The main source of humour in The Judge is his dialogue, which is as quick and witty as audiences have fondly become accustomed to from such roles as Tony Stark and Sherlock Holmes. Yet, Downey gives his most emotional performance in years and is both convincing and wonderfully moving. Robert Duvall is also very good. He is extremely real in his portrayal of a man who is in mourning, but at the same time is angry with the world and very much in denial about his own reality. Downey and Duvall work brilliantly together and there are some truly remarkable confrontation scenes between the two of them. 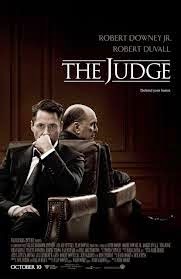 The Judge is a film with a story like many others, but the strength and intensity of it's performances by Robert Downey Jr. and Robert Duvall gives it the edge to put it above the films in it's class it could be compared to.